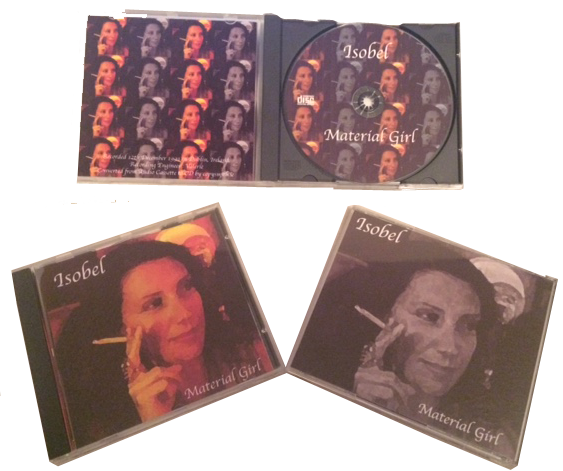 With a photo file and a 1993 audio cassette recording Copysmith were requested to create a CD for Isobel’s 40th birthday by her sisters. Taking the recording and converting to an MP3 file before writing as a audio CD utilizing our Hofa mastering software was the easy part. The recording was still good quality so this provided a “good” listen on CD. The photo Isobel’s sisters sent was of low resolution so the first thing was to increase the dots per inch to 300 or print quality. This did not solve all the issues and the photo was still losing quality as we played with design ideas. We decided we would use an Illustrator effect that would detract away form the photo’s quality. After trailing a few effects we settled on “Watercolour”, giving the photo a painted look. We also then converted the image to black and white so we had some contrast to play with. Using the front and back covers as mirror opposites, and choosing one colour image and one black and white image, provided for an effective design paradox. Using alternate images on the disc and the inner front cover provided the contrast we needed to complete pour design. Isobel’s sisters were delighted with the results and we hope Isobel had a great 40th birthday !